The Roadmap is a frame of reference for the design and execution of regional actions in education and contains recommendations for the national implementation of public policy on this issue. It also supports coordinated and coherent progress on priority issues for the countries of the region such as the quality of education, equity and inclusion, teachers and education personnel and lifelong learning. The Cochabamba Agreements were endorsed by the representatives of the countries that attended the regional meeting in Bolivia. They are based on the Buenos Aires Declaration (2017), the first milestone in the regionalization of SDG4-E2030 that allowed the countries to contextualize the global decisions adopted in the Incheon Declaration emanating from the World Education Forum in May 2015 from this continent. 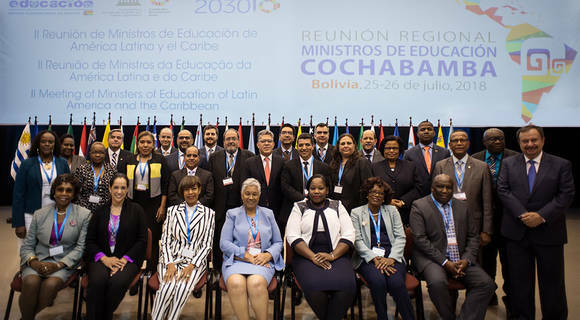 The Buenos Aires Declaration provided a shared vision of the 2030 Education Agenda from Latin America and the Caribbean and was aimed at generating strategies and programs that seek to achieve these targets at the national and regional levels for 2017-2030. The Regional Steering Committee shall establish four working groups that will drive specific actions in review, monitoring and reporting; policy and strategies; advocacy and communication; and finance and governance. The groups may seek the support of technical experts whenever necessary. In the agreements, the authorities committed to strengthen intersectoral collaboration and to explore opportunities for the participation of young people and adults in regional coordination mechanisms. They also agreed to meet every two or three years and to entrust OREALC/UNESCO Santiago with organizing regional meetings in coordination with the Regional Steering Committee and the hosting country.